CDR Open File Tool is one of the easiest and most efficient tools for data recovery purposes, supporting the processing of CDR files. This software works with any version of CorelDraw so you may simply get the installation file of CDR Open File Tool on your computer, click it to start and get some rest until the analysis of damaged illustration is running. Despite the ease of user activities, CDR Open File Tool features an intelligent and powerful data recovery engine, repairing many known issues in Corel Draw drawings. This program is the best choice to repair CDR files when other ways of data retrieval are not available so you may count on CDR Open File Tool anytime, if the damage affects the structure of CDR files. 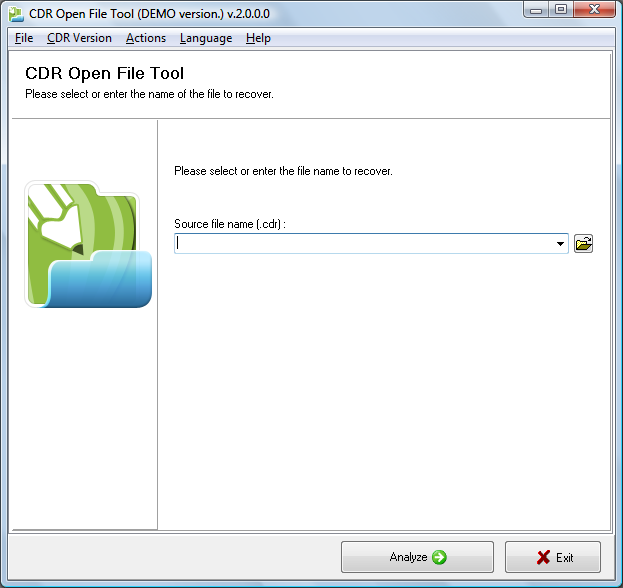 Since all CDR repair activities are fully automated, CDR Open File Tool can be applied by any user, it can be done by experts or beginners in computers. As soon as you start CDR Open File Tool, select a file of CorelDraw supported format and start the automatic analysis of selected CDR file by clicking the Analyze button. Keep in mind you may open even very large projects in this application without the loss of efficiency, CDR Open File Tool opens any document of CDR format without considering the state of input information. Moreover, you can use this software on any computer in the local area network and open corrupted drawings remotely. Besides, this service is compatible with any hardware in use on your PC, please report any issues to the developers of CDR Open File Tool. If something goes wrong with the process of CDR file repair, this application can be forwarded to the developers of CDR Open File Tool, it is safe because we always protect the privacy of our users. As for the rest, feel free evaluating this tool for as long as you need and register CorelDraw recovery solution when it is clear that it works and successfully repairs CDR files. 2014-10-28 2.0.1.0 New release of damaged CDR files open file tool.